planning features and top itineraries to help you plan the perfect trip. The guide tells you all about local secrets and hidden travel gems that will make your trip unique. Plus visa & permit information, activities, community-based tourism and the Silk Road. This new edition of Bradt's Uzbekistan continues to offer more practical detail for independent travelers than any other guidebook to that country, written by expert authors who have lived and worked in Central Asia since 2008. With first-hand descriptions of everything from UNESCO World Heritage Sites and the world's best collection of Russian avant-garde art, to riding across deserts by camel and cooking plov, Uzbekistan's authors bring the country alive in this updated 2nd edition. Comprehensive details of accommodation, restaurants and public transport options are included, along with a number of detailed maps, trekking and hiking routes and off the beaten track locations, as well as full information on how to travel around the country by bus, train and shared taxi. There's more on the country's flora and fauna, and detailed, hard-hitting information on the current state of the economy, domestic politics and foreign affairs. All listings have been thoroughly updated and the latest highlights brought to the fore. - Comprehensive bird-watching and wildlife sections are provided by experienced twitcher and BBC journalist Ben Tavener and there is a thorough introduction to the Uzbek and Russian languages. This groundbreaking guide, now extensively revised and updated, focuses on the wealth of sites and colorful legends at the heart of Central Asia, plus the best of the rest - excursions covering the major attractions of neighboring republics Kazakhstan, Kyrgyzstan, Tajikistan and Turkmenistan. Dieser erste deutschsprachige Reiseführer, der ausschließlich Usbekistan gewidmet ist, entführt den Leser auf eine Reise von Taschkent über Samarkand nach Buchara und Chiwa. Zahlreiche Informationen über die Geschichte dieser Städte sowie über die Geschichte und Entwicklung des ganzen Landes machen dieses Buch zu einem wertvollen Reisebegleiter. Von der islamischen Zeit über die Timuridenherrschaft die Khanate die Sowjetzeit bis ins moderne Usbekistan - eine Entdeckungsreise durch Geschichte, Kultur, Kunst und Gesellschaft. Auch aktuelle Themen wie der Islam und die Stellung der Frau werden diskutiert. Mit Stadtporträts, Stadtplänen und großem Serviceteil. Wer vorhat Usbekistan auf eigene Faust zu erkunden, wird ohne Grundkenntnisse der usbekischen Sprache nicht auskommen. Nicht oft trifft man auf Menschen, die Deutsch oder Englisch sprechen. Wahrscheinlicher ist es, dass sie Arabisch oder Türkisch sprechen. Usbekistan gehört ja zum "islamischen Orient". Auch mit Russisch bleibt man Ausländer. Wenn Sie jedoch nicht als Fremder, sondern als Gast nach Usbekistan kommen wollen, so wird Ihnen allein das Bemühen um die usbekische Sprache viele Türen öffnen. Der Kauderwelsch-Band vermittelt unkompliziert die Grundkenntnisse der usbekischen Sprache. Dies ge schieht mit hilfe einer einfach lesbaren Lautschrift, die keine Vorkenntnisse erfordert. Einfach zur Hand nehmen und schon kann man die ersten Worte sprechen! 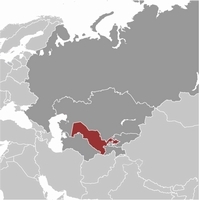 Kazachstan Zuid, Kirgisistan, Tajikistan, Turkmenistan, Uzbekistan. toeristische informatie, pijpleidingen, afstanden in km.